Former Hidalgo County Court-at-Law No. 6 bailiff Oscar De La Cruz, center, walks with his attorney Santos Maldonado, left, and his wife Areli Garza De La Cruz while leaving the federal courthouse Tuesday, May 15, 2018, in McAllen. 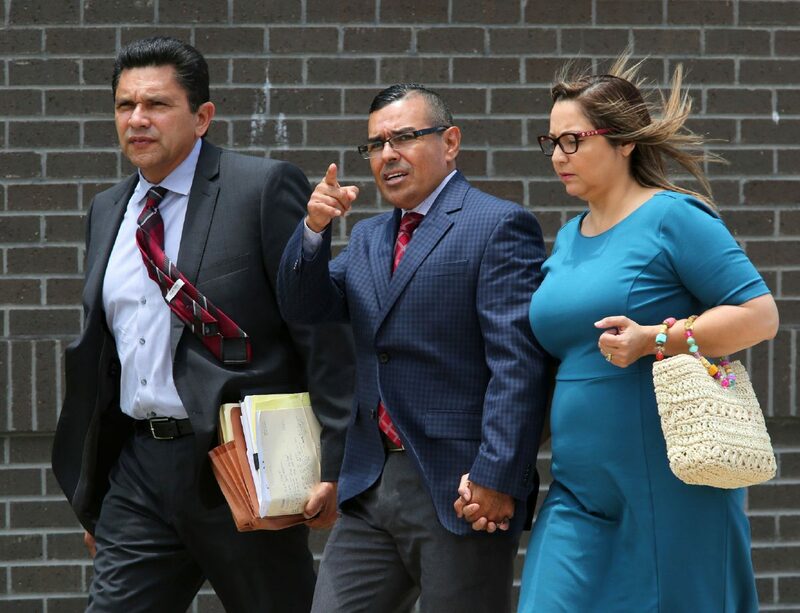 McALLEN — Oscar De La Cruz was back inside a federal courtroom Tuesday for a status hearing in connection with two new charges added to a superseding indictment. De La Cruz, who now faces two drug conspiracy charges, and one federal forgery charge, stood before U.S. District Judge Micaela Alvarez Tuesday afternoon. The former bailiff for Hidalgo County Court-at-Law No. 6 was accompanied by his attorney, Edinburg-based Santos Maldonado. Also at the status hearing was Arturo “Petu” Vargas (or “Cholo”), one of the more than 15 defendants named in the overall indictment, and the second person in the same case to be represented by Maldonado. The court held the hearing to make De La Cruz and Vargas aware of a potential conflict that may arise later during the course of the case; ultimately deciding after meeting with Maldonado and government prosecutors that Maldonado could not continue representing either man in the case. Maldonado was hired by De La Cruz after his arrest on conspiracy charges, and was appointed by the court to represent Vargas, court records show. Vargas will have a new attorney appointed by the court, while De La Cruz will also have to hire a new attorney moving forward. De La Cruz was one of four men added to an indictment alleging a cocaine conspiracy and an allegation that the former bailiff also forged a former U.S. Magistrate’s signature on a federal search and seizure court document, the indictment states. “Oscar De La Cruz did knowingly forge the signature of Dorina Ramos, a U.S. Magistrate judge for the Southern District of Texas, for the purposes of authenticating a document, to wit, an anticipatory search and seizure warrant,” the court record shows. Filed last Wednesday, the amended indictment also alleges that former Donna ISD police officer Juan Fernando Mata, as well as Marin “Filtro” Macrin Cerda, Jose Miguel “El Mickey” Montemayor and Cesar Alejandro “Nucho” Tovar-Guillen (or “El Sobrino”) are part of a drug conspiracy, court records show. De La Cruz’s appearance in Alvarez’s courtroom was the first such appearance since his detention hearing last Tuesday before U.S. Magistrate J. Scott Hacker. During that detention hearing the government, represented by Assistant U.S. Attorney Roberto Lopez Jr., claimed that De La Cruz was not being forthcoming about his finances based on the investigation into him, and the discovery of bank records that showed large unexplained cash deposits. Mata, 39, of Donna, appeared in federal court Thursday afternoon for his arraignment and detention hearing in connection with the allegations. The government alleges in one count that the defendants conspired to possess and distribute more than 5 kilos of cocaine from January 2016 to February 2018, the indictment states. Mata pleaded not guilty Friday to a single drug conspiracy charge in the seven-count indictment, with Hacker granting him a $150,000 bond with a $4,000 deposit, court records show. 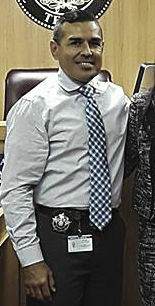 Montemayor, of Mission, and Macrin Cerda, a Mexican national, were also part of a group called “Los Mikis,” who were arrested in October 2017 in connection with a series of burglaries of a habitation and intent to commit other felonies, and engaging in organized criminal activity, San Juan Police Chief Juan Gonzalez said last October. Jorge Antonio Calvo-Ayala, 25, of Pharr pleaded guilty last year to conspiring to possess with the intent to distribute more than 5 kilograms of cocaine. Alvarez sentenced him earlier this month to 95 months in prison, court records show. Vargas, 35, of Mission, joins a group of defendants who have also pleaded guilty in the conspiracy and are pending sentencing, including Mission residents Danny Cano, 30, Antonio Javier “Little T” Gomez, 28, and Marlyn Gonzalez, 39. Additional defendants who pleaded guilty and are also pending sentencing include Miguel Marin “Tigre” Cerda, 30; Jose “Coco” Garcia-De La Torre, 22; Carlos Guadalupe “Tomy” Aquino-Pacheco, 20; Alfredo “Chore” Avalos-Sanchez, 26; Gustavo Angel “Tripa” De Leon-Covarrubias, 19; and Jose Arturo “Gordo” Reyes-Sanchez, 19, along with Juan Antonio “Paisa” Flores, 27, of Weslaco.